Due to limited space and high demand for our information sessions, prospective students that cannot attend these sessions can register for general campus tours held by the UNCG Office of Undergraduate Admissions through their website (link opens in new window). We would be happy to individually meet with you before your tour to discuss your specific interest in Beyond Academics. Please email beyondacademics@uncg.edu so we can make sure we are available to meet with you during your campus visit. Our Spring Session will meet in the Elliot University Center (EUC) Dogwood Room. You can generate driving and walking directions to the EUC through Spartan Directions (link opens in new tab). The Information Session will include a presentation and Q & A about the Integrative Community Studies certificate program (Beyond Academics) and Monarch College Support Services, along with a guided tour of campus. You will also have a chance to meet with our staff representatives and students. We ask that you arrive 15 minutes before your scheduled tour time, so that we can get started as promptly as possible. Visitor parking is available in the Walker Avenue Parking Deck and is available 24 hours a day at the rate of $2 for the first hour and $1 for each consecutive hour with a $10 day/entry maximum. 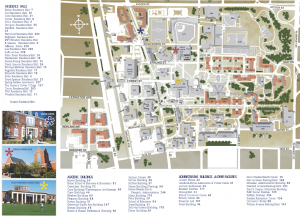 Additional information about visitor parking on campus is available here.